Strengths: Regular strength, or extra strength. Prevagen is a dietary supplement. And is taken for a healthier brain, sharper mind, and clearer thinking. Prevagen contains the ingredient apoaequorin. Apoaequorin is a protein, that is obtained from a specific type of jellyfish that glows. Apoaequorin is a protein our brains need for healthy brain function, that is diminished in the aging process. Clinically shown to help with mild memory problems associated with aging. Support a healthier brain, sharper mind and clearer thinking. Prevagen Regular strength contains 10 mg of apoaequorin, and Prevagen extra strength contains 20 mg of apoaequorin. Bottles contain 30 capsules or 30 chewable. You take one pill a day. I started taking Prevagen about 2 years ago. At first, I noticed no difference. But after taking it for 3 months I noticed that my thinking did become clearer. It was as if my brain fog was lifted. I was able to recall things better. For example, I would walk into a room and forget what it was I was coming in there for, but if I paused for a few seconds I was able to recall what it is I was coming into the room for. Before, I was unable to do that. It was so aggravating. I was able to focus better. And my skill for problem-solving improved. I know am able to work on crossword puzzles again, where before I had no interest because I was unable to focus and/or comprehend. In general, I saw improvement in my thinking, it was clearer and more focused. I had better recall memory as well. My brain fog was beginning to clear. The capsule is easy to take. With no after-taste or odor. My only con with this product is with the price. I was not always able to afford it. But when I was, I was able to feel an improvement in my memory. Specifically in the areas of recall, focus, and clearer thinking. I was skeptical at first, but after taking it consistently for a period of 6 months, I began to notice a difference in my brain functions–in the first 3 months. Even my boss at the time asked me if I was taking my Ginkgo Bilboa again (that’s what I took, before Prevagen), and I told her no, that I was taking Prevagen. So see, she noticed an improvement and that’s when it sealed the deal for me. When someone else could tell the difference, the product was legitimately helping me. I gave it a rating of 9 out of 10, only because I think it’s rather expensive. But that is just my opinion. Would I recommend it?? Yes, I would. Great review! That specific product is not available on Amazon.ca website but others are. Why did you switch from Ginko to this product? And which would you say gave you the best results? I find that I have more brain fog when I eat too many processed carbs, but that is me. I had stopped taking gingko, a few years ago. I read where it didn’t really help with memory, so I quit taking it. 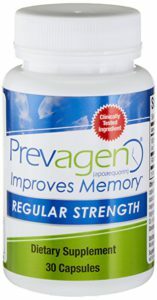 I found Prevagen when I was looking for other supplements for memory. I can’t really say if the ginkgo worked or not, cause I wasn’t really paying attention. But, with the Prevagen I did notice a difference. Let me know if that helps you any. And, I’ve read where carbs, can cause that brain fog….I’m horrible with avoiding them though. I have been curious about Prevagin for years and just saw it in the store on the shelf again last week and wondered if it worked. I have not tried but I always think “I should give it a try”. It is interesting to hear it helped you but took a few months. I will be looking at the rest of your site to see what you recommend. I have many auto-immune conditions and have found a world of natural treatments that help but I am always searching for more. Vit D and B vitamins seem to help my brain to function as well as a bit of a weird one…Flonase nasal spray. Of course it is not natural! It is really helping though and my doctor said I should keep taking it if it works. It also helps with inflammation in general for me. Give it a try and let me know what you think of it. I just wish it wasn’t so expensive. It is cheaper on Amazon, then I’ve seen in the drug store. I too have an auto-immune condition. I take Vitamin D as well. I take fish oil for inflammation as well as a Probiotic. I read where 90% of our inflammation comes from the gut, and the probiotic helps with that. For me, if I can control my inflammation, I have a better handle on my pain. Have you heard of CBD Oil? I take that for pain. I started taking it last November, and I’ve not taken Vicodin since then. Now it does not work if I have a flare up, but if stay on top of the inflammation, I usually can avoid flare-ups. Thank you for stopping by. And I hope you’ll read the rest of my blog. I may even do an article on the CBD Oil, so keep checking back, k? Wow sounds like a great product! Would this be considered a nootropic? Been considering taking supplements to enhance memory and mental function, but looking for the right one. Hi Will, you’re the second person to mention nootropic, I had to look that word up. I do not believe Prevagen is a nootropic, but I could be wrong. Whatever you decide on, supplements, my word of advice is to research the heck out of it. Read customer reviews, those are what I look for. And I hope you find something. Thanks for stopping by and let us know if you find something, and you’re taking it and it works! This looks like a great product for senior. Lord knows my Dad could use it. He is always forgetting where he put his glasses. Well that’s Dad. I do have a question. Would Prevagen work for someone under 25? I clicked on the link and there were quite a bit of negative reviews, so I am a bit skeptical. It looks like a fake nootropic medicine to me to be honest with you. Hi Alex, I almost didn’t include Prevagen in my article, cause I too saw the negative remarks. But then it did work for me, so I included it. Just like with any medicine, what works for you won’t work as well on another. I found that to be true with CBD Oil as well. As for under 25, I don’t know. I don’t recall reading anything about not taking it for any age. What I have noticed is since writing this article I started doing crosswords, daily. Sometimes word search and then an app on my laptop called Mind Games Pro, and I can already feel more alert. I believe it is exercising my mind, I mean our brain needs exercise too, right??? Maybe try that instead??? Very interesting information! I haven’t heard of Prevagen or even Apoaequorin before. Very insightful and good to know! Hi Holly, thanks for stopping by. I can’t recall where I learned about the Prevagen, but I learned of the apoaequorin, shortly after. When I researched the Preveagin, I learned about the other, since it is an ingredient. It’s a decent product!! Hi Laura, and thanks for the review. I’ve heard of this product but never tried it. I like that you said it helped your thinking become more clear and focused. I think that’s something I could use in my late 50’s, haha. Hi Suzanne, thanks for stopping by. Yes, it did work. I was surprised. Get this though, since writing this article I’ve started doing crosswords, word search and Mind Games Pro–downloaded for $5 on my laptop. I don’t do all of them every day, but I do at least a crossword, and I’m seeing little tiny improvements!!! I am serious. Give it a try!!!! I’m going to keep doing what I’m doing!! !